It is said that a party without cake is just another meeting, and we agree wholeheartedly. For this first edition of Wedding Cake 101, we'll cover all the essentials of this sweet delicacy. Be sure to look out for the next edition of the Wedding Cake 101 for more insights on cakes as there are actually plenty of aspects that we can discuss about wedding cakes, but we'll stick to the basics, for now. Is a Wedding Cake a Must? A wedding cake is commonly served following dinner at wedding receptions. Prior to serving, a cake-cutting ceremony is usually held as a symbol of good luck and prosperity for the couple and all the guests. In modern times, however, the wedding cake serves more as a centerpiece instead of something that's actually served to the guests, especially in large weddings with over 1,000 guests. 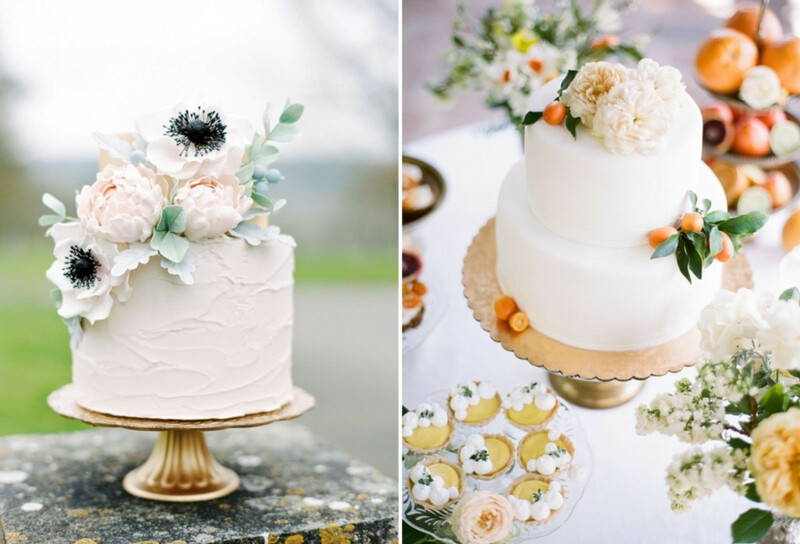 This takes us back to our initial question: is a cake really necessary in a wedding celebration? Is it a must, your wedding cake? Yes and no. If the wedding cake tradition and what it symbolizes are important to you, then by all means please do have one. If you feel that it isn't necessary, then feel free to omit it. Surely, you know better about what you want and don't want to have on your wedding day. It all comes down to you. If you love sweet treats but aren't that fond of cakes, you can always opt for other desserts such as a cupcake tower, croquembouche, or well-dressed dessert table. This is also a question that rises almost too often as brides are clueless about the size of the wedding cake they need to serve the guests. Here are some basics. The normal cake shape is usually round or square, yet plenty brides have chosen to go with other shapes like heart, or oval, or even request to have a castle-shaped wedding cake. The number of tiers depend also on your theme and venue; a three-tier cake will disappear in a large ballroom wedding and a five-tier cake will look enormous in an intimate wedding set. for intimate weddings, opt for one up to three tier cakes will be optimum and for large weddings, five to seven tiers would be sufficient. On the serving standpoint, here are some tips. To get more servings, make a larger base tier, increase the size of each tier, add satellite cakes (single tiered cakes placed on platforms complementing the primary cake), and prepare sheet cakes in the kitchen for extra. The latter is actually a very common thing to do in large weddings and is a great idea to tackle possibilities of cake shortage. If the wedding cake is out, you can easily cut the sheet cakes and serve them to guests as a replacement for the cake. For fewer servings subtract the number of tiers, reduce their size, and limit or omit satellite cakes. 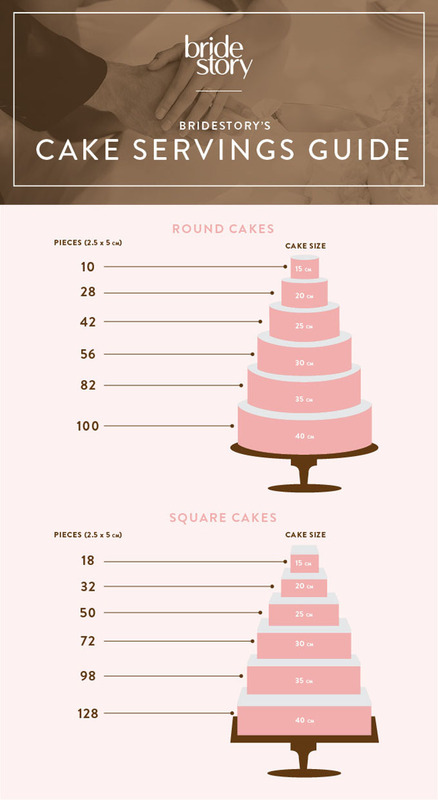 Below is a graphic for cake sizes to get you started on the right track. 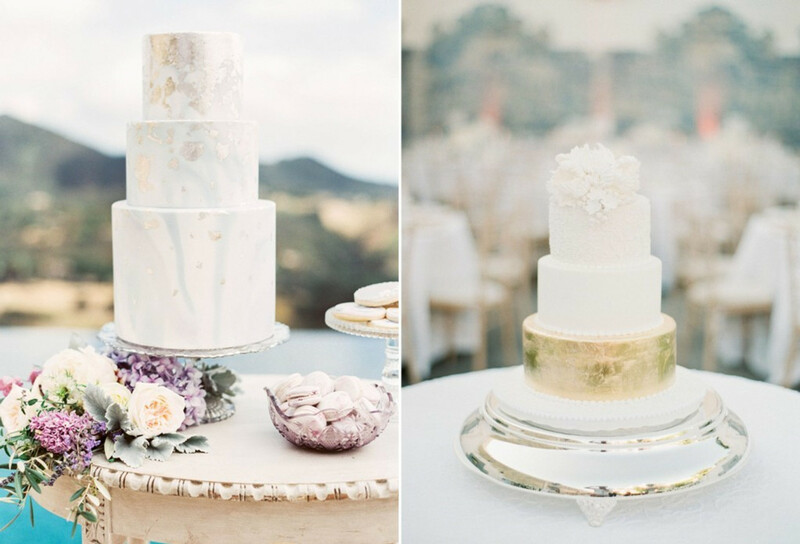 As with every element in the wedding industry, cake trends shift pretty swiftly. Putting together this list turned out to be quite difficult, thanks to the abundance of creative ideas that have emerged in the past year. Even so, the 10 cake trends below have become increasingly popular and will most probably stick around for the next year. Take a look and comment below if your favorite is on the list! 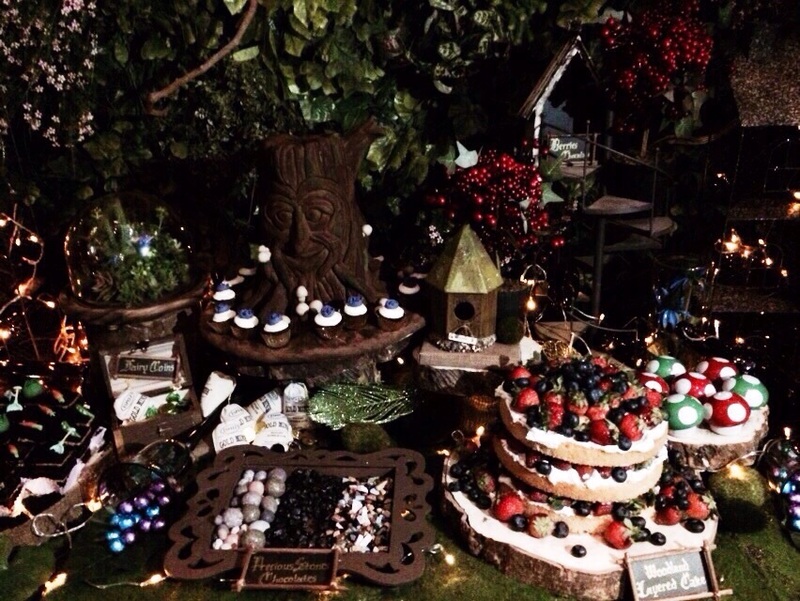 Popular for elegant rustic weddings is the woodland cake. The woodland style is most often done on short cakes with solid colors adorned with greeneries and a small amount of flowers. 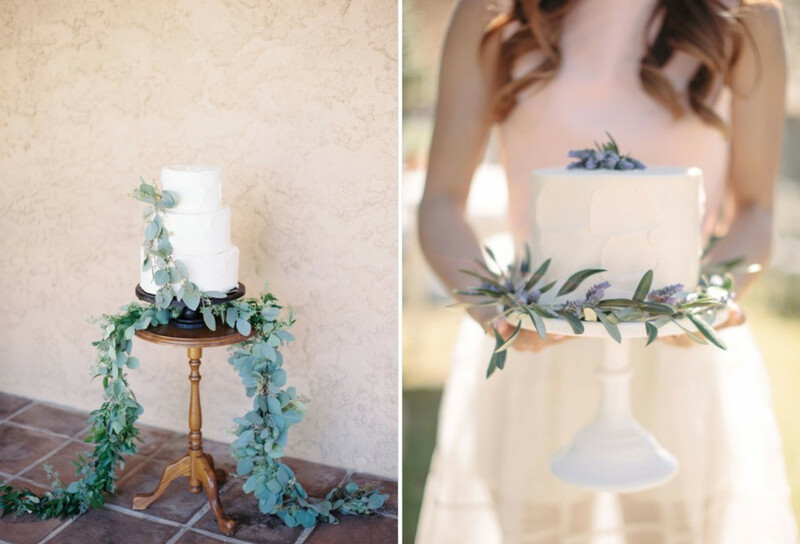 For this cake, you can ask your baker to create a one to three-tier cake, frosted in white or ivory, and garnish it with either olive leaves or silver dollar eucalyptus leaves with sprigs of small flowers like lavender or baby’s breath. A cake with metallic parts will definitely stun anyone who lays eyes on them. 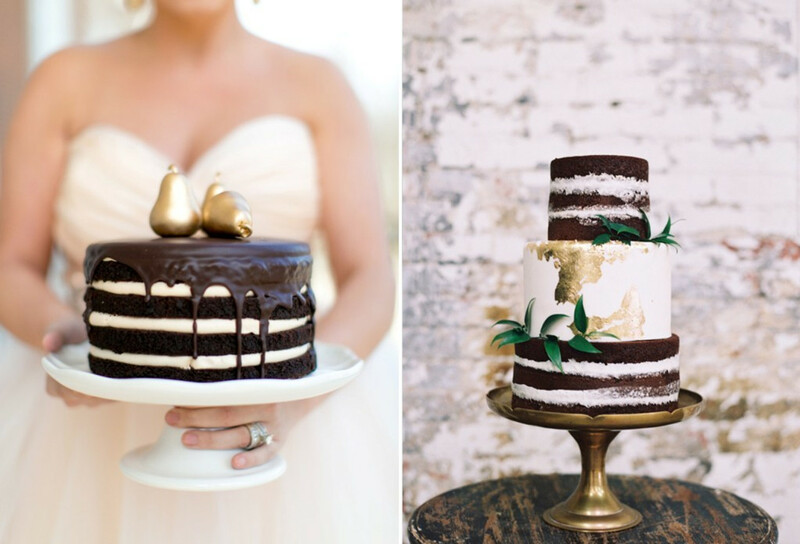 It’s basically a cake adorned with either edible gold foil or gold paint to accentuate some parts of the cake. You can have it in gold or silver and match it with any other color. Just make sure that you know which color should match with which bling, as some colors go better with silver than gold and vice versa. 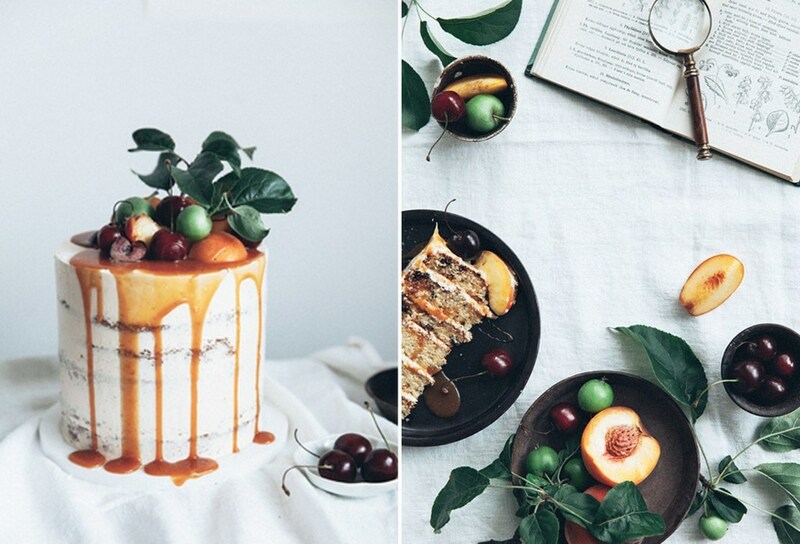 Another trend that has become increasingly popular is using fresh fruits and flowers as decorations on the cake. As creating fondant or buttercream flowers will cost more, this is an alternative that you really should consider. The fruits that are commonly used are small oranges, figs, pomegranates, and berries. As for flowers, the possibilities are endless. Keep in mind though, that to have fresh flowers and fruits gracing the cake, you really need to calculate how much weight your cake structure can bear as they are heavier than fondant or buttercream frosting. Putting too much can cause your cake to bend; no one would like that. 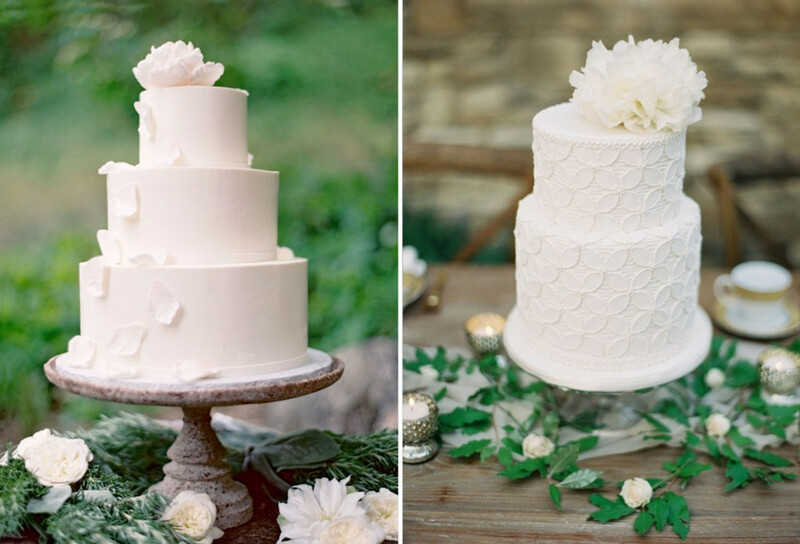 Classic all-white cakes are timeless and will always be beautiful no matter what. To add variation and keep your cake from looking dull, add something to the cake that will make it more visually appealing. 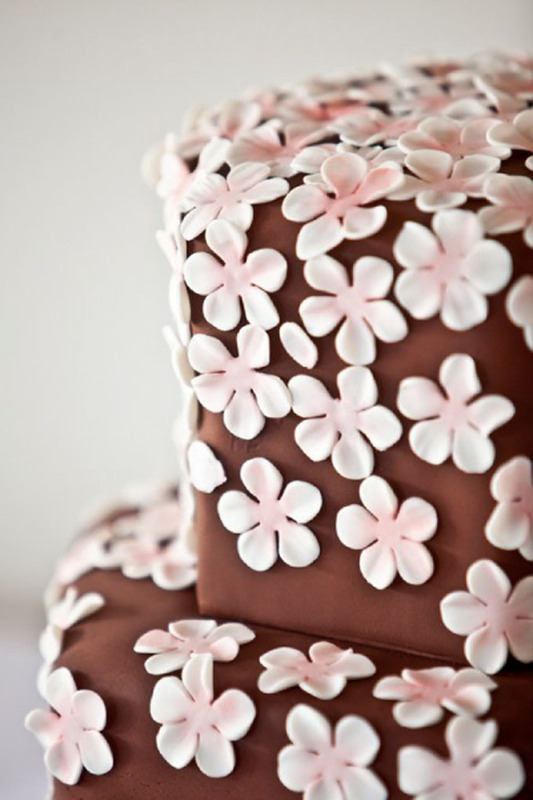 You can add flowers or graphic patterns, or have a falling petal décor on the cake to make it look more dynamic. Naked cakes are cakes left unfrosted, bearing a raw, unpolished beauty. They've been very popular in rustic wedding settings, but newer variations are starting to become a familiar sight in the world of elegant weddings. Combine it with other kinds of cakes to make it suitable for other types of weddings. It’s not easy to create a neat naked cake so choose a vendor experienced in creating this kind of cake. Also, if you’re having an outdoor wedding, be sure to maintain the cake moisture as it can dry out more easily than frosted cakes. 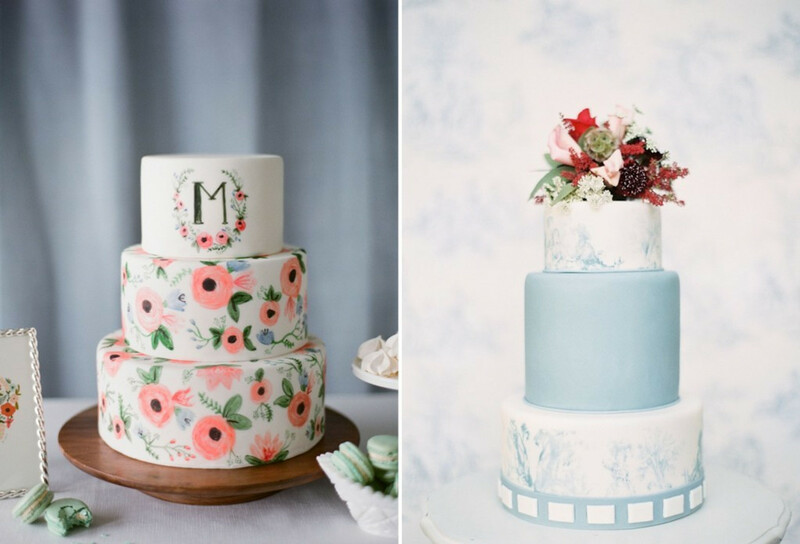 Hand-painted cakes are a lovely way to add any pattern or drawing that you like to your wedding setting. For this type, be sure to pick a skilled baker to help create the patterns and drawings that you would like to have on your wedding cake. Some cute ideas for this would be to create floral patterns, marbled textures, even your monogram or illustrations painted on the cakes. The next one is geometric patterns on the cake. Patterned cakes are really on the rise these days. You can create something predictable like the cake on the left, putting repetitive patterns all over the cake, or create a more dynamic graphic cake like the one on the right. Cakes like these will go very well with the whole wedding if your other wedding elements (invites, stationary, and décor) use the same pattern as the one on the cake. 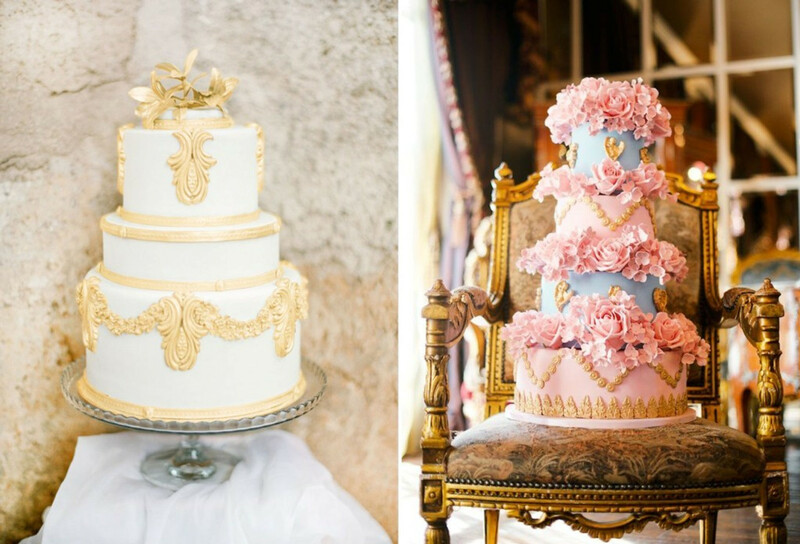 The baroque speaks of all things lavish and opulent, and you can easily picture these beauties in glamorous weddings. They actually remind us of the beautiful works and art of the Marie Antoinette-era, don’t you think? To get the look, ask your baker to create intricate patterns to really get the glamour going on the cake. Gold embellishments are most recommended and don’t forget to use vibrant colors and lavish flowers for maximum impact. Even though the fondant is the safe and easy choice for wedding cakes, fancy buttercream frosting has found its way back to the wedding cakery world and all the way to our list. The cool thing about buttercream is that you can play with its textures and colors. You can make swirls, waves, little blobs, and any other creative compositions that you like. With buttercream cakes, there are three things to pay attention to. First, find a baker skilled with buttercream as it’s not a skill everyone masters. Next, consider the weather. Buttercream melts under the sun, so if you’re having an outdoor wedding it would be better to skip it. Besides, buttercream is sticky; you don't want to have any debris stuck on your cake. Third, be very careful when moving it and keep it off the curious hands of children. 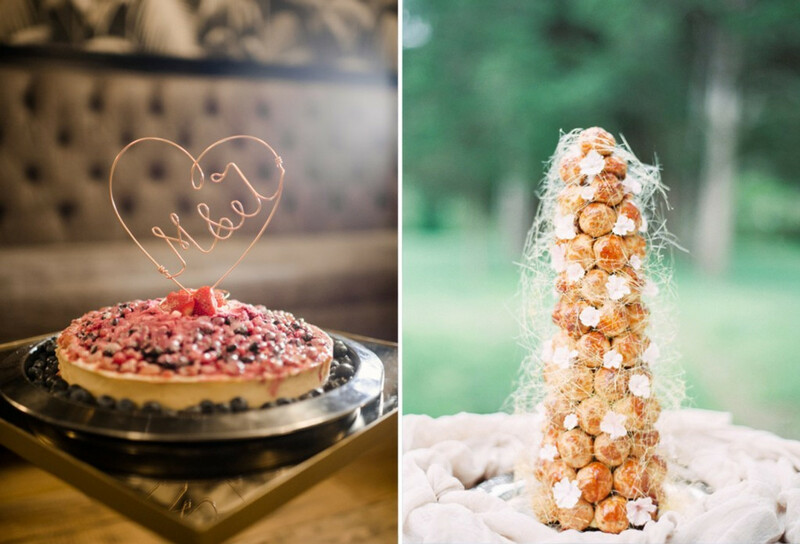 As we have mentioned earlier, the cakeless custom is predicted to be trending in the near future, and some brides will replace the traditional cake with other sweet treats like a dessert bar, pie, or the famous croquembouche. 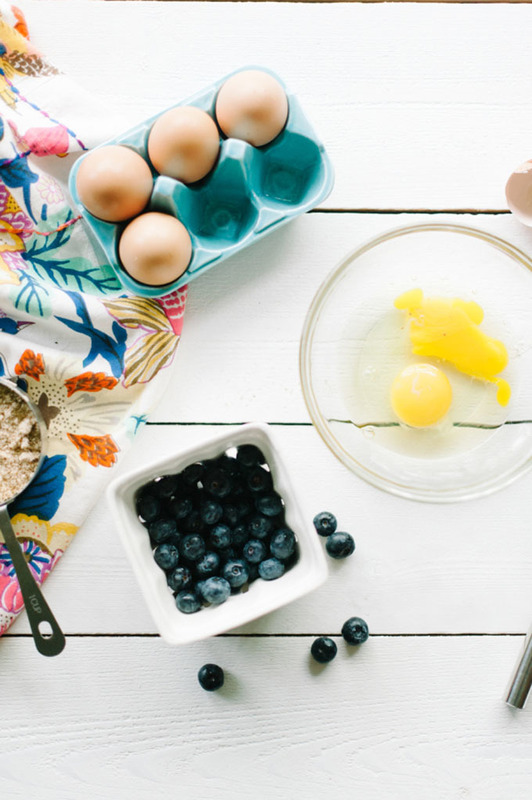 To get you inspired, take a look at the article we’ve written on dessert alternatives to replace the cake. Research is always the first step to any wedding element planning. Do your research on prices, styles, vendor choices, and the vendor's availability on your wedding day. Being knowledgeable is always a good start. Keep all your wedding elements in harmony by always considering your theme and venue. 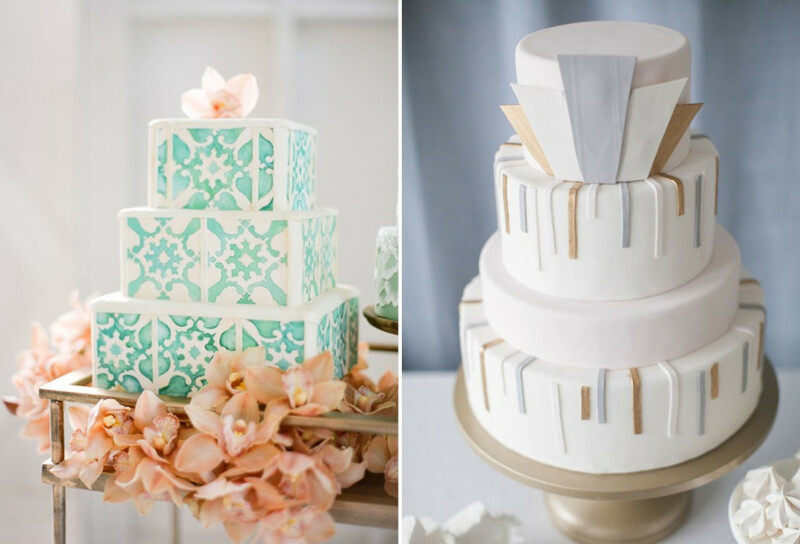 First, choose a cake style that suits your theme. 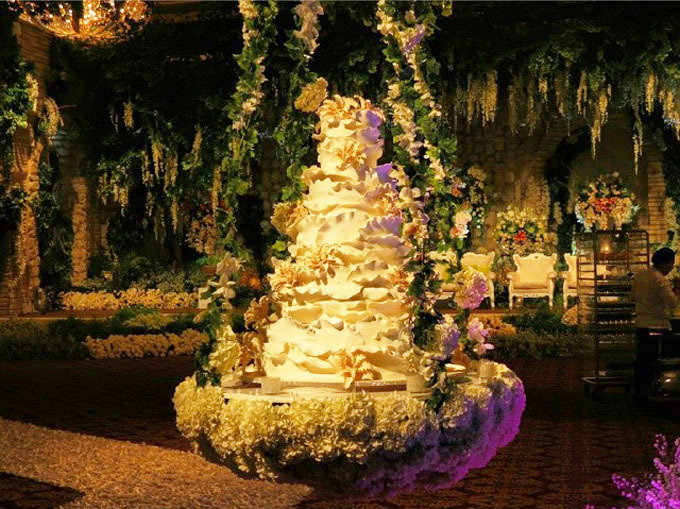 A woodland cake in a glamorous wedding or a baroque cake in a ranch wedding will not do well. After deciding on everything, always make detailed plans for delivery. On what time and to which place do you want your cake delivered? Is the vendor going to set it up for you? Will there be anyone at the venue to help watch the setup? Will the cake stand be decorated by the decorator? If yes, at what time and where? All of these questions need to be carefully considered. To avoid being overwhelmed, ask for help from your wedding planner. Consider the space and surroundings at your wedding venue. If you have a small space with low ceilings, don't risk having a big and tall seven-tier cake. It will stuff the room and make your venue look smaller. On the other hand, a three-tier cake will sink in a big ballroom wedding, so it would be better for you to have a bigger cake with a minimum of five tiers. Having your buttercream cake melt under the sun on your outdoor garden wedding day is surely a no. So remember to always consider the weather. An indoor wedding in an air-conditioned room will be friendly to any kind of cake, yet the sun will not be friendly to buttercream cakes, as the wind won't be to naked cakes. Fondant cake is always a safe option if you prefer it, yet if you don't, carefully plan to keep your cake tasty and unaffected by any weather condition. Don't just let your cake merely stand in the corner of the room, give it a spotlight. Other than for sharing with your guests, beautiful cakes are for displaying, thus do so accordingly. Some ideas: decorate the cake stand to attract attention, put it under a spotlight, or better yet, have a hanging cake like the one pictured here! Never take toppers lightly. Toppers give a personal touch that makes your cake different from the abundance of wedding cakes out there. They sign the cake as especially yours. For your toppers, you can have your name, your favorite line as a couple, or cute dolls and topiaries that symbolize you. Looking at the gorgeous cake trends above must have awakened your creativity and made your taste buds dance. 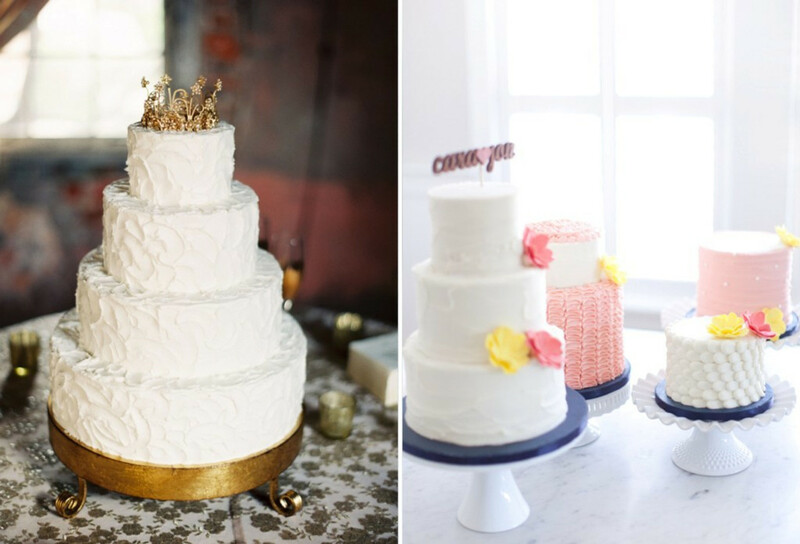 To help you on your next step, we've collected 10 bakers from all over the country who are experienced in delivering beautiful and tasty treats for weddings. Get to know them by going through the slider below and hop over to their profiles on Bridestory for more projects and info. Gordon Blue Cake has been an experienced player in the world of wedding cakes for years. With a that's glamorous and refined, Gordon Blue has gained trust from brides as a qualified wedding cake baker. The bakery suggests placing an order six months prior to the wedding for optimum satisfaction as they will have to design all the necessary details for the cake to look irresistible. Other than customized wedding cakes, they also provide cookies, cupcakes, and dessert tables to cover all the sweet treat needs for your wedding. 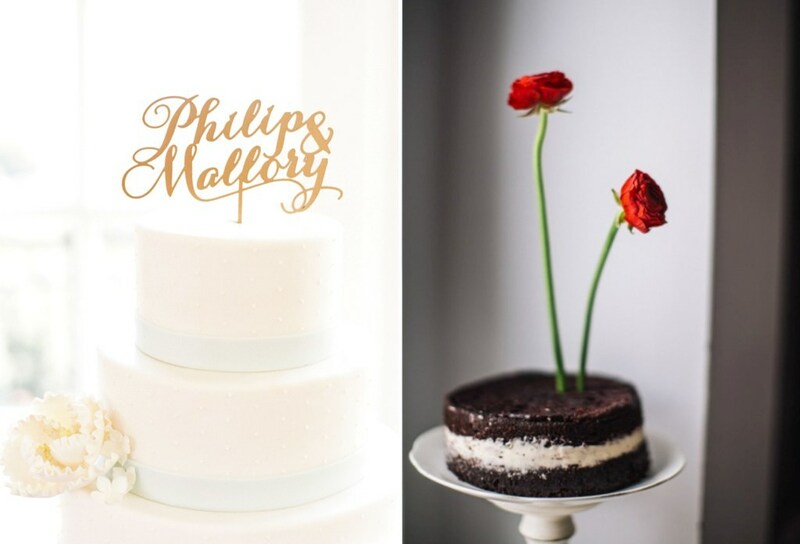 Their three-tier cakes start from Rp 4,800,000, five-tier cakes start from Rp 7,200,000, and their seven-tier cakes start from Rp 8,500,000. Here's one top contender in Bali, Crème de la Crème. Started in 2010, Crème de la Crème polishes their wedding cake artistry with each creation with an elegant and rustic approach. They also provide custom cakes and dessert table service for your big day. Prices open from Rp 3,750,000 for three-tier cakes and escalate according to the number of tiers and the degree of difficulty of its design. Prices include delivery costs within the Denpasar area. Providing service in Jakarta and Surabaya as well as Bandung, Timothy Cake is one vendor you can't miss. Started way back in 1979, Timothy Cake is, without a doubt, a qualified baker when it comes to wedding cakes. It has also been well-proven by celebrities and famous names of Indonesia that have used Timothy Cake's services to provide cakes for their special day. Intently supervised by owner Timothy Pratana, all cakes that come out of their oven are guaranteed in quality and taste. Starting prices are Rp 3,800,000 for three-tier cakes, Rp 6,000,000 for five-tier cakes, and Rp 8,500,000 for seven-tier cakes. A well-known name in the wedding industry, LeNovelle has been gracing the world of wedding cakes with splendid and sophisticated cakes. Their true secret, however, lies on the details as each figurine and detail is handcrafted intricately. LeNovelle is proud of the five flavors they have which are Irish coffee, black forest, American chocolate, cheese, and lemon and perfects the recipe each time to make sure that their cakes aren't only good-looking but also heavenly-tasting. If you wish to customize the ingredients of your cake (more rum, less rum, no rum), you can do that too. 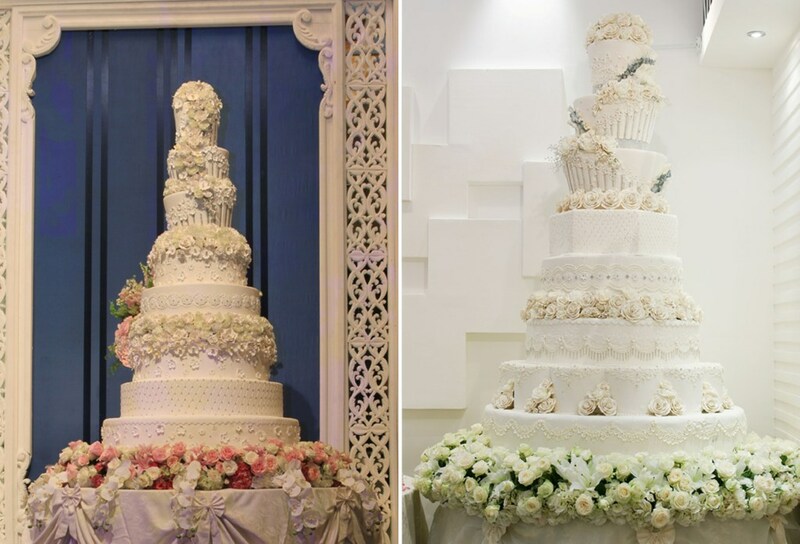 Their prices depend on the number of tiers and base cake diameters with the starting prices of Rp 5,300,000 for three-tier cakes, Rp 7,800,000 for five-tier cakes, Rp 12,700,000 for seven-tier cakes, and Rp 16,000,000 for eight-tier cakes which includes the table, table cloth, tray, and saucer. Elly's Cake Art Boutique started in 2003 and has been firm on their signature style: dazzling and glamorous. Aside from wedding cakes, they also provide dessert tables to complete your wedding treat needs. With Elly's Cake Art Boutique, you can rest assured as they have all the answers to your questions such as why fondant costs more than buttercream. For the prices, a wedding cake starts from Rp 3,000,000 depending on the design, flavor, and number of tiers you need and a desert table starts from Rp 2,000,000 up to Rp 5,000,000. Started as a small home industry in 1998, Ixora Cakes is the love child of husband and wife Julia and Helmut. Bringing together their experiences in European and Indonesian cuisine, the couple grew the business and until today, has been the industry leader in Bali. Whatever or theme you wish to have as your wedding cake, Ixora can do it for you, from the rustic naked cake, down to elegant or even glamorous cakes. Their prices are available upon request so be sure to head over to their profile on Bridestory to inquire for their price list and contact details. 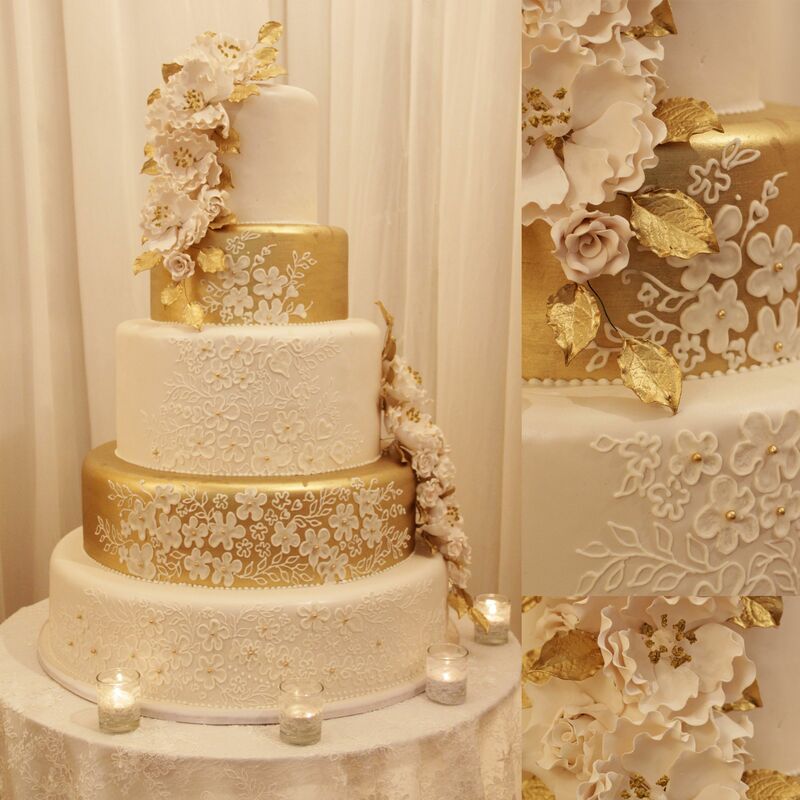 Femy's has been around since the year of 2001, creating luscious and glamorous cakes with an elegant touch. Specializing in customized artisan cakes, your cake vision will surely become a reality under their talented hands. If you're a bride that fancies elaborate cakes with fine detailing, then Femy's creations will most probably suit your style. 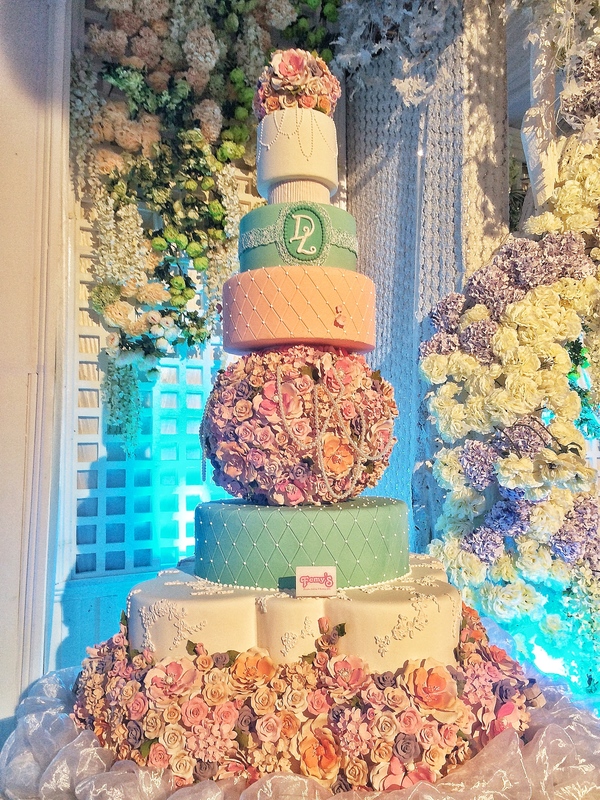 Their prices start at Rp 6,750,000 for five-tier cakes, Rp 8,750,000 for custom seven-tier cakes, Rp 9,750,000 for custom-designed eight-tier cakes, and Rp 10,750,000 for custom-designed nine-tier cakes. Ingredients are also customizable at Femy's; it's a sure thing that there's a cake for everyone. A vendor that has multiple talents is CDC Corp. Also delivering intricate decorations, our multi-talented friend brings you delicate desserts and sweets for your wedding and special celebrations. 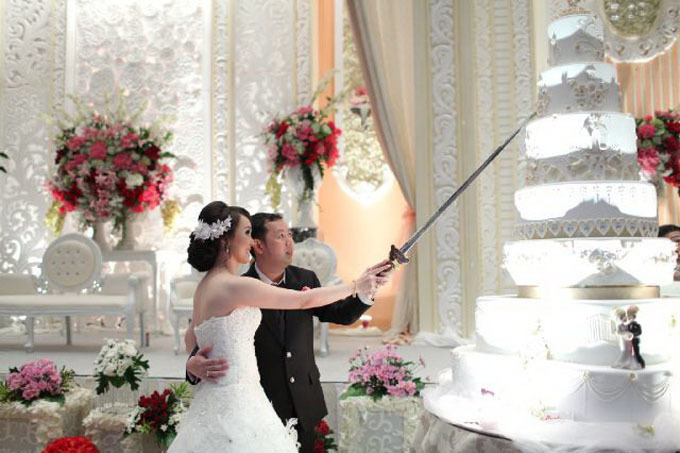 Based in Bandung, CDC Corp opens prices at Rp 4,500,000 for wedding cakes. That's not all, they also provide dessert tables that start from Rp 4,000,000. With their signature rustic style, CDC Corp's creations will stun rustic-loving brides everywhere. This vendor does not only deliver delicious cakes, they do so in the most affordable prices. Starting from Rp 1,500,000 per cake, Barley Cakes is the go-to vendor for affordable yet delicious cakes. Other than custom cakes, Barley Cakes also provides other sweet treats such as cookies, cupcakes, and pastries that will be perfect for your dessert table or wedding favors. 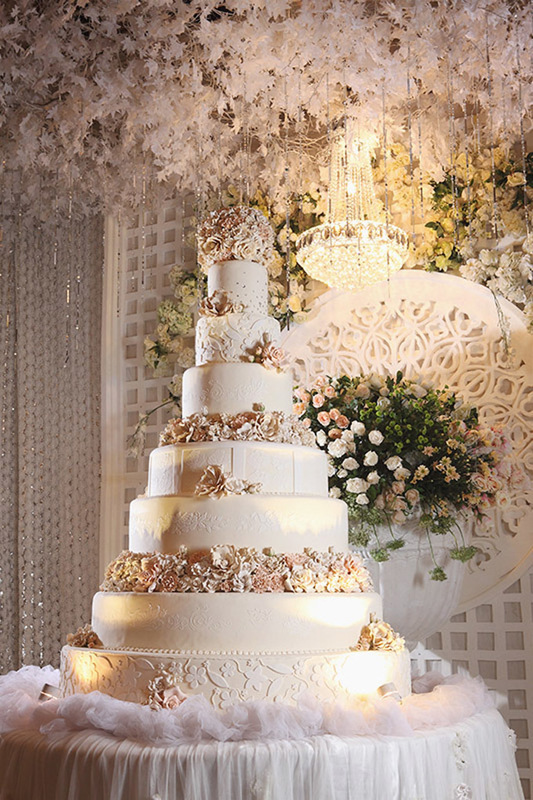 Last but not least is Cream and Lace Cake, based in Jakarta. 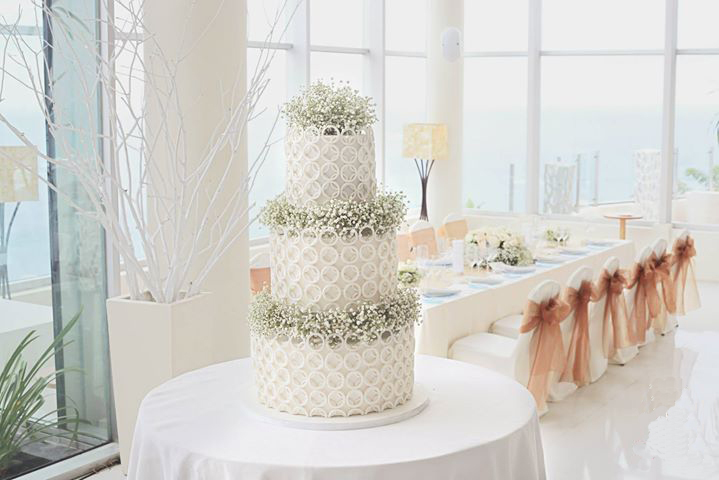 Founded in 2004 by Dion Riyadi, Cream and Lace grants the wishes of brides wanting to have the cake of their dreams while still keeping their expenses under control. They specialize in soft and elegant cakes with intricate and detailed decorations such as sequins, beadings, engravings, and Swarovski crystals. As the owner, Dion, is very strict on color accuracy of each cake that comes out of his kitchen, you don't need to fuss after entrusting your wedding cake to Cream and Lace. 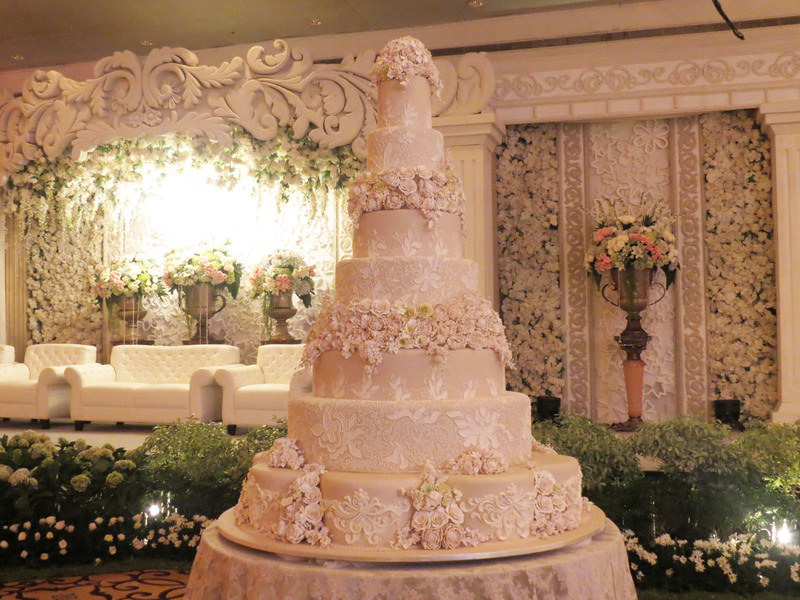 Their prices start at Rp 4,500,000 for three-tier cakes, Rp 7,500,000 for five-tier cakes, Rp 10,500,000 for seven-layer cakes, and Rp 13,000,000 for eight-layer cakes. There you have it, your simplified wedding cake guide. Do share with us, which one is your favorite trend?